Waring Green Dance with Michelle Holding and the “Monkey Box” Band on 16 March 2019. If anyone tells you that English Ceilidh Dancing is in decline, the Ryburn Barn Dance on Saturday 16th March was proof that they are wrong; it is alive and rocking – at least it is in Brighouse. A good crowd of dancers braved the flooded roads and were treated to a brilliant night of music and dance. 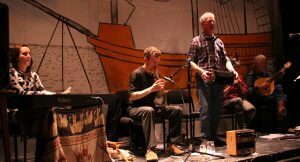 Tom Kitching is a phenomenal fiddle player and he brought with him Peter Crowther on bass guitar and the eccentric talent that is Edwin Beasant, playing melodeon and harmonica; collectively they are known as Monkey Box. The sound they produced was glorious (Credit to Heather on the sound desk) mixing old favourites with self-penned tunes, highlights being Peters lyrical bass, Tom’s waltz for a dance called “Follow on Marianne” and some slick harmonica licks from Edwin. Michelle Holding is acquiring a reputation in ceilidh circles for her intelligent, sympathetic calling and her ready humour. On Saturday she showed that she also has an extensive repertoire of dances which she calls with precision and confidence. Mixed in with old favourites like the “Circassian Circle”, “Steamboat”, and the “Old Swan Gallop” were dances new to me; “Helly Owens” by Jane Bird, “Uptown” from the Dartmoor Pixies and “Offa’s Dyke” (among others). So, another hugely enjoyable evening, courtesy of a sprung dance floor, a talented trio of musicians and a great caller; you should have been there! 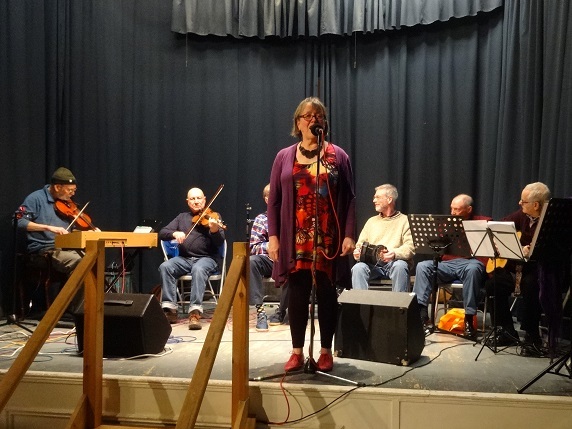 A good crowd of nearly 50 dancers turned up at Waring Green Community Centre on a surprisingly mild Saturday night for the monthly Ryburn 3 Step Barn Dance, which featured the Four Hand Band and caller Sue Coe on 16 February. The Four Hand Band is a duo consisting of Mary Humphreys on keyboard and Anahata on melodeon. Both are talented musicians who excel in a range of traditional musical skills and their performance on Saturday combined a solid dance-able rhythm with inventive lines around a range of well-chosen ceilidh tunes. Sue Coe is familiar to Ryburn 3 Step ceilidh goers as the caller for the Black Box band and other local ceilidh bands. She called a mix of well-known dances such Bridge of Athlone, Buttered Peas and Nottingham Swing, dances made up by some of the schools in which Sue has taught (Westfield Four Star, Zetland Circle Dance) and some less well-known dances. The evening concluded with everyone on the dance floor for Soldiers Joy. who together (with the help of the excellent sound engineers Johnny and Chris) produced a wonderful, full sound that filled the hall. Steamboat; Longways for as many as.. Thanks to all who came along, dancers and performers, for a friendly and enjoyable evening. All tickets for the New Year’s Eve were sold some time ago and, come the night, the hall was packed with enthusiastic dancers. Some were Ryburn Barn Dance regulars and some were at a barn dance for the first time. As usual, the band for the dance was The Black Box Big Band made up of Ryburn 3 Step stalwarts and comprised Alice Jones on piano, Chris Partington and Johnny Adams on fiddles, Chris Coe on hammer dulcimer and Michael Beek on tuba. Most of the tunes were old favourites (Lemonville, Quarryman, Four Seasons, Morpeth Rants (old and new) Bill Halls (1 and 2), Paddy Carey’s etc.) and beautifully played at spot-on dancing speed. Once again, Pete Coe was our caller. Pete has a wide repertoire of dances and selected a programme that alternated easier and more complicated dances. The dance floor was full for every dance and even the ceilidh novices soon picked up the figures (with a little help from the regulars). Midnight was greeted with the traditional rendition of Auld Lang Syne, sung to the admittedly English bagpipes (shut your eyes and you could imagine they were Great Pipes) followed by the last dance, Soldiers Joy. Thanks to dancers who stayed behind to help clear up the hall and thanks again to Ryburn 3 Step for great night. What a night we had in the Victoria Hall, Ripponden, last night! A large crowd of dancers; regulars and novices, local and from many miles away, came to enjoy themselves and get into the festive mood as we approach Christmas time. 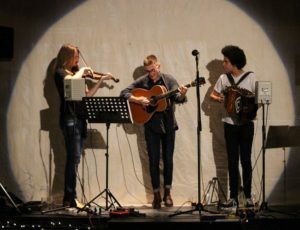 Granny’s Attic, comprising Lewis on fiddle, George on guitar and Cohen on melodeon, are rising stars of the folk club and festival scene. Barry Goodman is the perfect caller for these occasions; he called a lovely range of dances which were slightly out-of-the-ordinary but easy to do with his guidance. With his spot-on calling and lightly humorous encouragement he had the dancers in the palm of his hand. Granny’s Attic are the ideal Folk Dance Band. With huge musical talent and ability, they play sets of tunes for the dances which range from the unusual to the well-known. Their sound is full and their style is full of excitement and enthusiasm – great to dance to, and great to listen to as well. The Victoria Hall was seasonally decked out with pretty lights, bunting, and a fabulous Christmas tree. Hot drinks, mince pies and cakes made by the Ryburn Longsword dancers were available (for a small donation! ), and to crown it all Granny’s Attic played out with a set of Christmas carols like what you’ve never heard before……. Thanks to the R3S organisers and to Johnny Adams and Chris Partington for providing the PA. It was a perfect evening. 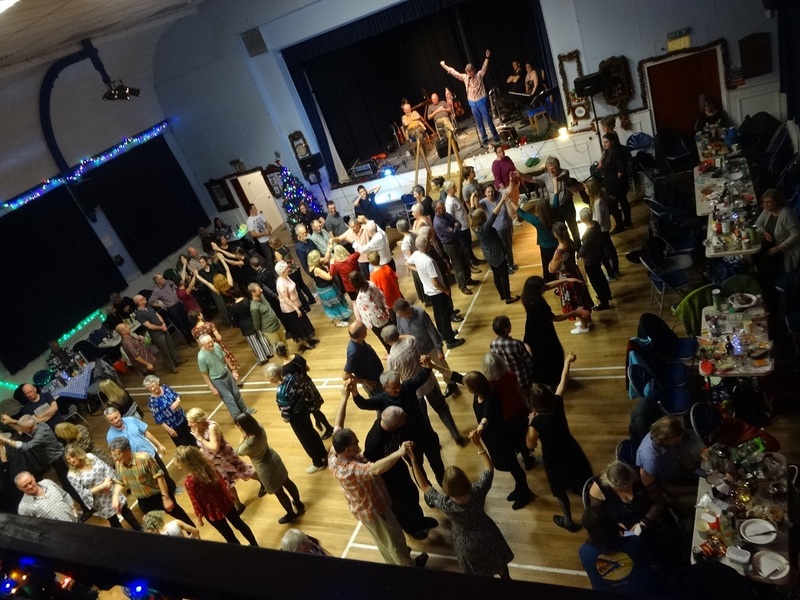 The second Ryburn 3 Step barn dance of the 2018 -19 season took place in the Waring Green Community Centre on November 17th. Our caller was John Brown from Sheffield who has called for us on a number of occasions and never disappointed. Music was provided by Posthumous Curtain, which comprises Alice Jones and James Tween. James plays melodeon and has a fine repertoire of tunes gleaned from the playing of many classic bands and arranged by him in well thought out pairings. Allied with Alice’s percussive and inventive piano accompaniment the result was both danceable and listenable music. The last Ryburn 3 Step Family Barn Dance of the 2017 – 18 season took place on April 21st in its usual venue, the Waring Green Community Centre. Despite a modest turnout of dancers, dancers were treated to a great evening of music and dance. The band was Swift Nick, a relatively new outfit consisting of Keith Kendrick on concertina and percussion, Pete Bullock on piano (but not clarinet) Benammi Swift on melodeon and Sylvia Needham on banjo ukulele. Those of us who have had the pleasure of listening to Keith’s concertina playing know that he loves to embellish tunes. With solid support from Pete Bullock and Sylvia plus some cracking lines from Benammmi, the music was interesting, occasionally whimsical and always highly danceable. Pauline Jones is a regular at Waring Green and put together a programme of dances that have rarely had an airing from other callers. These included all of the list below. And Pauline’s choice of dances was clearly popular as most dances involved all or almost all the audience. As usual, she quickly established a rapport with both band and dancers and the whole evening was good-humoured, energetic and entertaining. 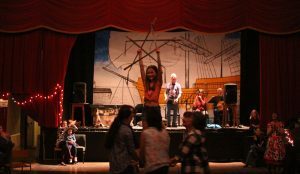 The Family Barn Dance at the Waring Green Community Centre on Saturday February 17th was well-attended and dancers were rewarded with a roster of familiar dances, some fine fiddle playing and a hefty dose of Tyneside wit. Johnny Adams and Chris Partington, doyens of the Village Music Project, were ably accompanied by Dee Dewitt on cello to reproduce an authentic Village String Band sound using some of the Village Music Project tunes. In addition, there were renditions of tunes rarely heard at these dances including “Blaydon Races”, for the dance of the same name, and for authenticity in dancing the Gay Gordons, “Scotland the Brave”. Benny Graham is well-known for his excellent singing and his role as singer and songwriter in the Pitman Poets. As a caller he brought a touch of self-deprecating geordie humour to proceedings and was happy to rely mostly on tried and trusted dances. This was helpful to the many Barn Dance novices on the floor. An additional treat was an acapella rendition of “The Snow that Melts the Soonest”. All in all, another great night of dancing and music enjoyed by all. Ryburn 3 Step danced away the final few hours of 2017 with a thoroughly enjoyable barn dance at the Waring Green Community Centre in Brighouse. As usual, the band was the Black Box Big Band which featured Black Box regulars Chris Partington (fiddle), Alice Jones (piano) and Steve Harrison (melodeon) ably supported by Johnny Adams (fiddle), Chris Coe (hammer dulcimer) and Michael Beeke (tuba and bagpipes). A sell-out crowd was treated to a host of familiar tunes played with verve and imagination including terrific versions of the Curlew and the Kirkgate Hornpipe (for the dance Clopton Bridge), Tommy Beadles and Earl Grey (for the Westfield Four Star) and Trip to Knaresborough and The Ball (for the Zetland Circle Dance). Pete Coe called the dances, pairing dances with the same formation (e.g. four couple longwise sets, four couple square sets) thereby encouraging dancers to stay on the dance floor. Dancers required little encouragment and the floor was full, even for the clapping dances. Starting with the Boston Two Step and ending with Soldier’s Joy, Pete ran through a series of well-known and popular dances including the Morpeth Rant, Cumberland Long Eight, Holmfirth Square and Flying Scotsman. He also included a couple of dances created in schools under his tutelage, the Zetland Circle dance and Athelstan’s Crown. The New Year was heralded by the singing of the Wassail Song and greeted with everyone on the dance floor, joining hands and singing Auld Lang Syne led by Michael Beeke on bagpipes. At the end of the night there was universal approval of the venue and rousing cheers for the band and loud applause for the caller. 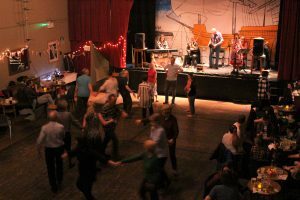 It will be another twelve months before the next New Year’s Eve dance but for those who cannot wait that long, there are Ryburn 3 Step Barn Dances every third Saturday most months of the year. 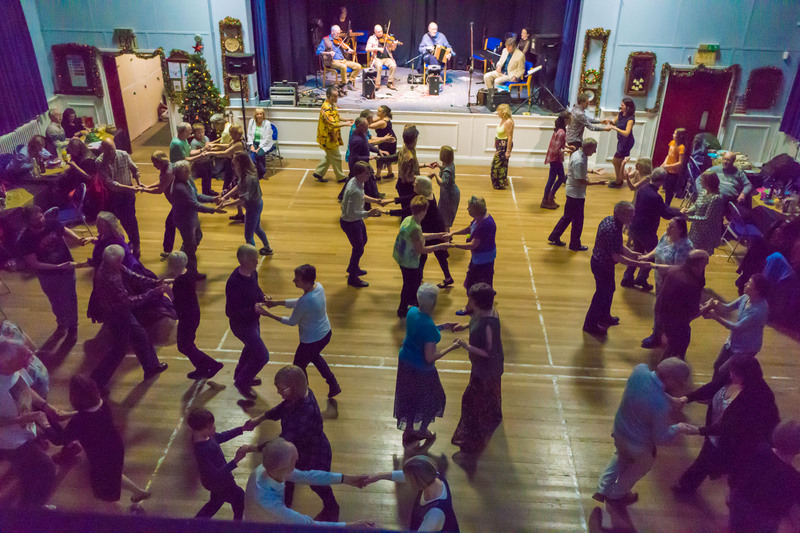 The Ripponden Village Christmas Dance at the Victoria Hall, Ripponden on Saturday 9 December was a great way to start the run up to the Festive Season. Thanks to all those who braved the icy cold to come along, the band “Offcuts”, John Brown the caller, Ryburn Longsword who brought cakes and provided hot drinks and festive decorations and did 2 display dances during the interval, and Steve and Pauline who organised it. The second Family Barn Dance of the new Ryburn 3 Step season took place at the usual location, Waring Green Community Centre, on Saturday October 21st. Multi-instrumentalist and Ryburn 3 Step Chair, Steve Harrison was celebrating a significant birthday and the Waring Green regulars were joined not only by a some new dancers but also by friends and family of the birthday boy. We were treated to some fabulous music from the highly accomplished Phoenix (I recommend you check out their new CD “All Fired Up”, which provided some of the tune sets we enjoyed on Saturday) and a range of great dances dished up with a liberal coating of Baz Parkes’ wit and wisdom. The next Family Barn Dance at Waring Green is on Saturday November 18th when the band will be Tenterhooks and the caller is Sarah Clough. More information HERE. 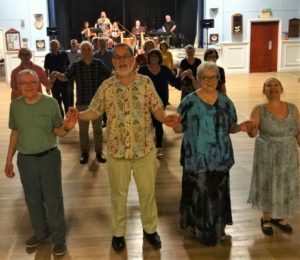 The Ryburn 3 Step dance programme got under way on Friday September 29th with a Village Dance at the Victoria Hall in Ripponden. Some years ago, Ryburn 3 Step ran monthly dances in the Central Hall which were well-attended and fondly remembered by many in the village. A dance at the Ripponden Victoria Hall in March this year, organised by Ryburn Longsword, was successful and justified setting up a couple more dances; this one on 20 September and another on December 9th. We hope you will come along and join us there. 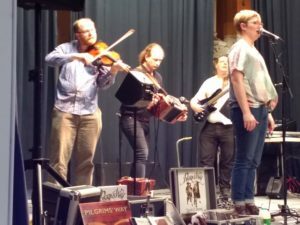 The band was a trio of young musicians sporting the name “Posthumous Curtain” which comprised James Tween on melodeon, Michael Beeke on English bagpipes, recorder and tuba, and Alice Jones on piano and whistle. The caller was Pauline Jones who helped to organise the event. Pauline called a variety of dances with different configurations (lines, squares, circles) and varying levels of difficulty. One or two dances seemed to cause collective issues of numeracy and orientation; for example in Lucky Seven the instruction to chain past six dancers and swing the seventh was interpreted in a variety of ways and mild chaos ensued. However, on the whole, the good people of Ripponden displayed sufficient dancing prowess to complete most of the dances as called and all credit to them for that. 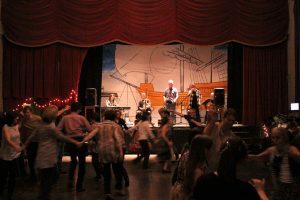 The organisers had hoped that the dance would appeal to a range of ages and abilities and, to their delight, there were family groups with young children, groups of friends, couples and people who came on their own. Pauline stressed that the English Country Dance etiquette was relaxed and that it was OK for would-be dancers without a partner to ask any of those sitting out to dance. Equally, if, after being asked, the request is declined, that is OK too and should not be taken as personal rejection. A full dance floor and bright smiles of enjoyment indicated that a good time was being had by one and all and the most common reaction of those leaving was to say how much they had enjoyed themselves and to ask when will the next dance be held. The Ryburn 3 Step Barn Dances always take place on the third Saturday in the month from October through to April which was Easter Saturday this year. Although some of our regular dancers were away on holiday, we had a good number of dancers and an enjoyable evening’s dancing. Caller Sue Coe recently received a gold award from the English Folk Dance and Song Society, in part for her work in promoting traditional English dance in schools up and down the country. Sue encourages the children to create their own dances and we were treated to three of these; ‘Westfield Four Star’, ‘Railtrack’ and the ‘Zetland Circle Dance’ (the latter with its distinctive clapping pattern which is harder than it looks). Many of the other dances were favourites such as ‘Bridge of Athlone’ and ‘Clopton Bridge’, and the evening was rounded off with everyone on the dance floor for ‘Soldiers Joy’. Tenterhooks provided a varied range of tunes which were well-matched to the dances. Particularly enjoyable was the pair of Lakeland jigs selected for the Circassian Circle called ‘Liberty for the Sailors’ and ‘Kendall Ghyll’. ‘Barley Break’ was pushed along in fine style by the jigs ‘Trip to the Lakes’ and ‘Whip her and Gird her’ and the various combinations of instruments gave a pleasing variety to the music. 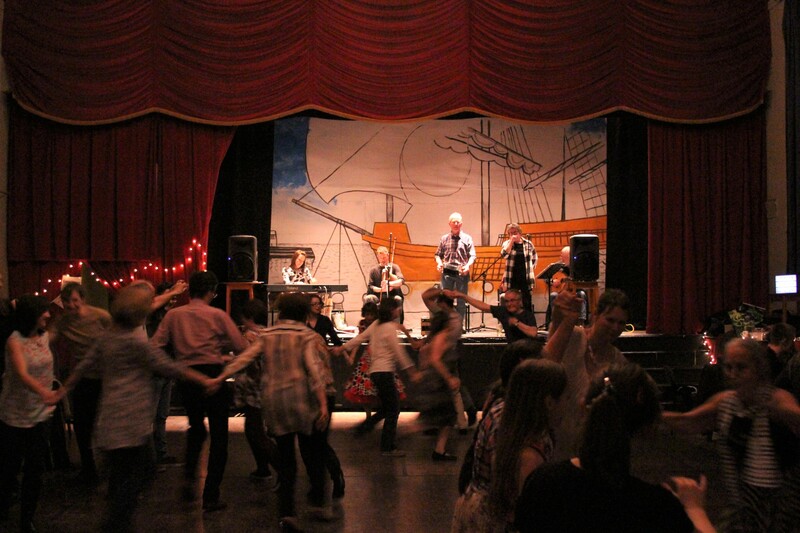 This dance was Ryburn 3 Step’s final barn dance of the 2016-7 season and the 2017-8 season begins on October 21st with Baz Parkes and Phoenix. However, there will be dances at Waring Green on May 20th and September 16th courtesy of Dave Webster. 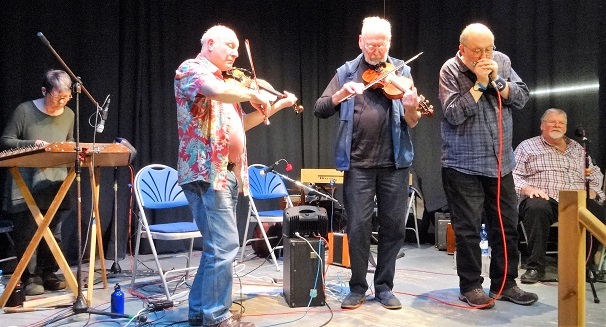 Last night’s barn dance at Waring Green featured the stalwarts of Ryburn 3 Step the Black Box Band with caller Pete Coe, and highlighted the organisation’s commitment to keeping English Country Dance alive in West Yorkshire. Declining numbers attending (and consequently revenue from) the Waring Green dances have meant that we are now focussing on booking local bands (and on occasions local callers) to reduce travelling costs. Since West Yorkshire has several excellent bands we have been able to maintain the quality of the dances. The crowd who came to the dance last night certainly did not leave disappointed. Pete Coe has decades of experience playing and calling for barn dances and he used that expertise to construct an interesting and varied programme. The evening was topped and tailed with old favourites the Boston Two Step and Soldiers Joy. In between we had dances from Scotland (Foulla Reel), Lancashire (Lancashire Reel) and, closer to home, Jack the Lad, which was collected in Barkisland and (uniquely, I think) has a curious “window wiping” clapping sequence. 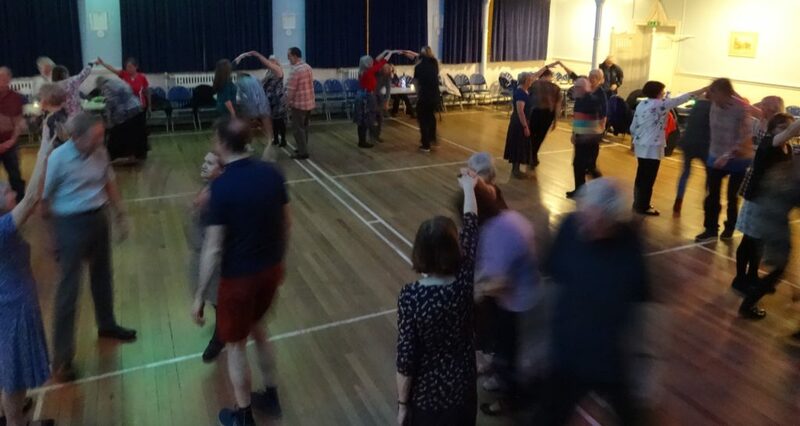 Interspersed were some of Pete’s own dances (Black Hole, 200 Not Out – extemporised at a birthday dance for four fifty year old friends and Athelstan’s Crown -which was devised with the help of pupils from Athelstan’s Junior School). The Black Box Band provided a solid musical platform for Pete’s dances and while many of the tunes were old favourites (e.g. Bielbie’s and the Kirkgate Hornpipes, the Hesleyside and Roxburgh Castle reels, Captain White’s and Four Seasons jigs), they were perfectly matched to the dances in terms of lift and speed. The musical highlight of the evening was the set played for 200 Not Out which comprised the Sadler’s Wells and Butcher’s Hornpipes. These lovely old tunes cascade lyrically over two octaves and were ideally suited to what is a rather stately dance. So, another great evening of music and dance for which we should be very grateful to the skill and generosity of the Black Box Band and Pete Coe. 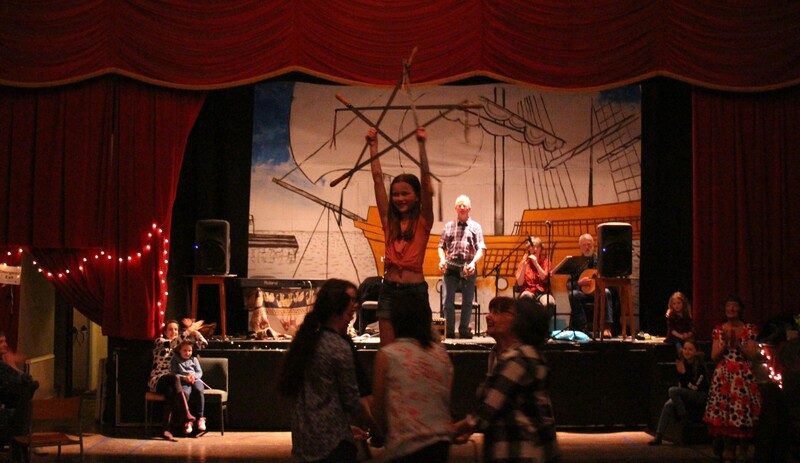 The Victoria Hall in Ripponden thundered to the sound of dancing feet on Saturday 11 March as Ryburn 3 Step staged two dances organised by the Ryburn Longsword Team. Early in the evening, a family barn dance was well attended by over 50 local children and their parents. For 2 hours the children (and their parents) enjoyed some energetic dancing, singing, and refreshments (provided by Ripponden J&I School PTFA). Proceeds from ticket sales and refreshments exceeded £200 and this all went to the Ripponden J&I School PTFA who helped organise the event. Live music was provided by the band ‘Offcuts‘ (who are some of the musicians for Ryburn Longsword), and the dances were called by Pauline Jones and Sue Coe, both Ryburn Longsword dancers. English country dances like Buttered Peas were interspersed with dances from further afield such as a Farandole (a French chain dance from Provence) and Pas de Loup played and called by bagpiper Michael Beeke. During the interval, local folk singer, Chris Coe lead a couple of songs accompanied by signing in Makaton (a visual language that uses signs and symbols to aid communication). Later that evening, ‘Grown-up’ dancers enjoyed a range of English dances again called by Sue and Pauline. Music for the dances, played by the band ‘Offcuts’, included a variety of traditional popular tunes including ‘Parson’s Farewell’ from Playford, ‘Because he was a Bonny Lad’ from the Northumbrian piping tradition and polkas from France and Belgium. Ryburn Longsword dancers gave a display of Longsword dancing during the interval. If you would like to find out more about Longsword Dancing in Ripponden (children and adults) look HERE…. Heartfelt thanks were expressed to the Conservative Club for the generous hall hire terms and excellent bar staff, to the Ripponden Co-op for raffle prizes, and of course to the members of Ryburn Longsword and their partners who set up, cleared away, and generally did the donkey work. A good crowd turned out for the January Barn Dance at Waring Green and they were treated to a fine evening of music and dancing. Caller Dave Hunt has many years of dance calling experience and is a regular visitor to Calderdale. We were treated to some dances written by Dave, including Shifting Sands (named after his wife) and his popular Waterloo Dance to the tune of the same name. Dave also introduced dances with unusual figures such as the double-backed chain in Bob Cann’s Sicilian Circle Dance and the North Country Ladies Chain in the Rifleman. As we have come to expect from Dave, he encouraged a certain element of mayhem in dances such as Three around Three and the Garland Square and if you are ever in a set and he claims that the Boston Tea Party can be danced by more than 6 couples, be prepared for an energetic workout. The music for the dance was provided by local musicians and Ryburn 3 Step stalwarts, the Black Box Band. With Johnny Adams providing a solid rhythm on the keyboard, the band played a succession of popular, lively and mostly northern tunes. Perhaps the musical highlight was the tune set for the Rifleman, when Johnny joined Chris Partington on fiddle, Steve played harmonica and, supported by Chris Coe’s dulcimer, they played two cracking versions of the Morpeth Rant, the second from the playing of border fiddler Tom Hughes. With at least seventeen dances over the course of evening and a final polka to the tune of Astley’s Ride, Ryburn 3 Step provided yet another great evening of dancing. 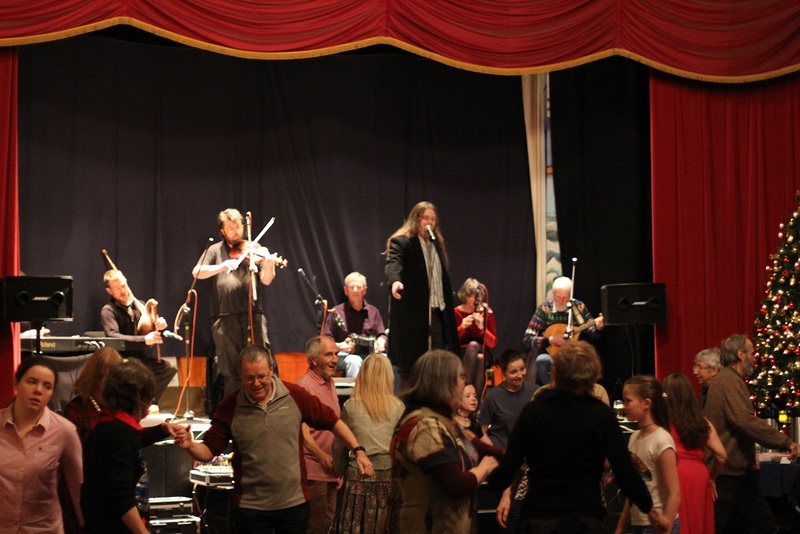 Last night around 140 people danced the Old Year out and the New Year in at our New Year’s Eve Ceildh at its regular venue, Greenhead College, in Huddersfield. Structural building work has resulted in a reduction in the floor space available for dancing but this did not deter an enthusiastic audience from having a thoroughly good time. The Black Box Big Band comprised Steve Harrison (melodeon and harmonicas), Chris Partington (fiddle), Alice Jones (piano), Chris Coe (hammer dulcimer) and Johnny Adams (fiddle). Together they played a steady stream of highly danceable (mostly northern) tunes. while Caller Sue Coe led dancers through sets of familiar dances including favourites such as “Buttered Peas,” “Clopton Bridge” and “the Willow Tree”. Sue also called some dances she has brought back from teaching at junior schools, which included the “Westfield Four Star” and the “Zetland Circle Dance” with a bewildering clapping routine. Budding dance caller Ivy called a couple of quirky dances, one of which included a figure she called ATM which included a different but equally puzzling clapping sequence. The evening ended with the singing of the Wassail Song and, on the stroke of midnight, a rousing rendition of “Auld Lang Syne” with a traditional circle of crossed-arms. One final dance of “Muffin Man’s Jig,” followed by a set of polkas and another New Year had been welcomed in. Thanks to the Black Box Big Band for the music, Sue Coe for calling, and all those who did the arranging and organising. December’s barn dance at Waring Green Community Centre was an irreverent and energetic romp through the English Country Dance tradition. 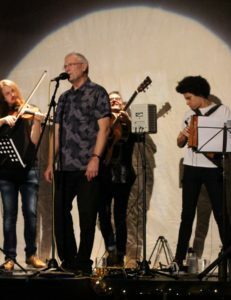 Caller Baz Parkes is well known to ceilidh aficionados as one of the best callers on the circuit with his extensive repertoire of dances and his ironic calling style. Interspersed between dance standards such as the Holmfirth Square, Clopton Bridge and the Cornish Six Hand Reel, were dances new to me such as the Atlantic Hornpipe, Four Jolly Sheepskins and (Mary Panton’s) Dear Jim. 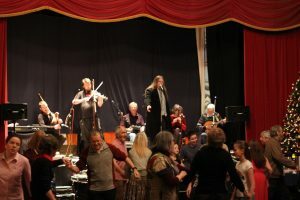 Peeping Tom is one of the most popular ceilidh bands around and demonstrated why, with great tunes played at a cracking pace that raised spirits and heart rates in equal measure. I lost count of the number of tunes that they included in their sets which, like Baz’s dances, mixed old favourites (Marmalade Polka, Bonnie Kate) with less well-known but equally danceable tunes. During the dance Ripple of Teign (written by Dartmoor’s Bob Cann) we were treated to solos on the cittern and guitar and a full run-through of the tune on the electric bass of John Macintosh. The pace was fast, the dancers flushed and even the Christmas tree in the corner was rocking. Thanks Baz and Peeping Tom for a great night! Barry Malin – drums and percussion. Caller Sid Calderbank announced that he had christened this month’s barn dance as “Hands Across the Pennines.” As he explained, a Lancashire caller with a Yorkshire band, calling Lancashire dances for Yorkshire dancers. As it turned out, Sid called dances from Ireland (“Siege of Ennis”) and Scotland (“Foulla Reel”, “Dashing White Sergeant”), as well as Yorkshire (“Goathland Square Eight”) along with Lancashire dances (e.g. “White Coppice” named after a Lancashire hamlet which boasts the “most beautiful cricket ground in England”). Providing the music was the local band, Tenterhooks, with Johnny Adams deputising for Alison Roberts. The combination of three fiddles worked brilliantly and old favourite tunes such as the “Morpeth Rant”, “Earl Grey” and “Four Seasons” were given new life with intricate harmonies and raunchy drones. Earlier in the set we were treated to a couple of Scottish tunes (“Rock and Wee Pickle Tow” and “the Noble Lord Dacre”) which introduced Paul’s border pipes to the mix but it was the tune “Will the Barber” for the Foulla Reel that really showcased the bagpipes’ wonderful sound and Paul’s excellent playing. 13 Circassian Circle; couples in a circle. “Joyous. Wonderful music …..fabulous dances” Fiona Miller, regular dancer at Ryburn 3 Step Barn Dances. 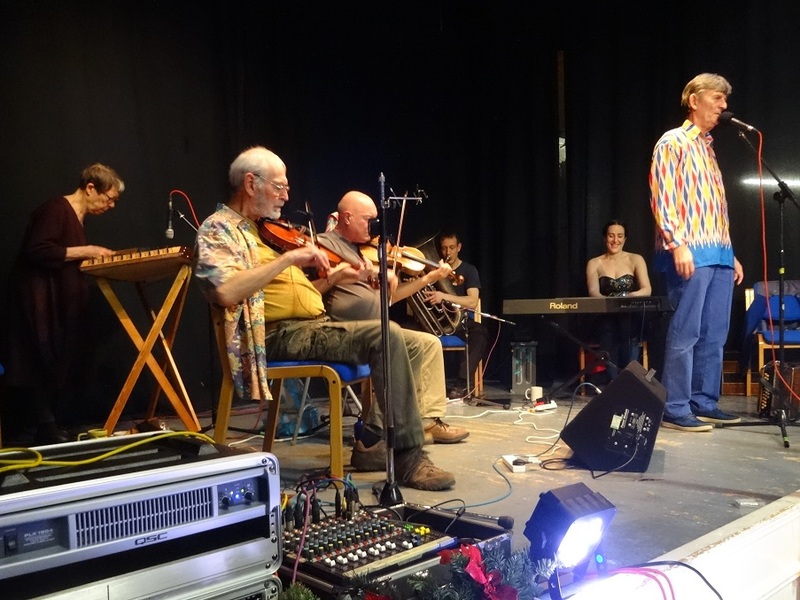 October’s barn dance brought Sheffield caller John Brown with one of his regular bands, Trinculo (also from Sheffield) to Waring Green Community Centre for a great evening of rousing music and excellent English ceilidh dances. Despite missing a number of Waring Green regulars, the dancing was enthusiastic and new dancers were readily incorporated to the sets by the more experienced. A list of John’s choice of dances is below. Highlights included an opening dance with three couple triangular sets called the “Mysterious Triangle”; the square set “The New Mrs. Arrowsmith” danced to a wonderful Swedish hornpipe translated as “Judgement”; a contra style dance written by Martin Harvey called “Aw Shucks” which was danced to two fine reels (one of unknown name but “collected” from the playing of Last Night’s Fun and a Quebecois reel called “Le Quatre Ser en l’Air”; and a final gallop in the Beckett formation (long sets with partners side-by-side) in the “Yarmouth Long Dance”. Trinculo’s line-up of bass, guitar, piano accordion, fiddle, whistles and soprano saxophone generated depth and pace with an eclectic choice of tunes and original arrangements. John’s dances covered a range of styles and degrees of difficulty which were accessible to new dancers and challenging enough for the Waring Green regulars. 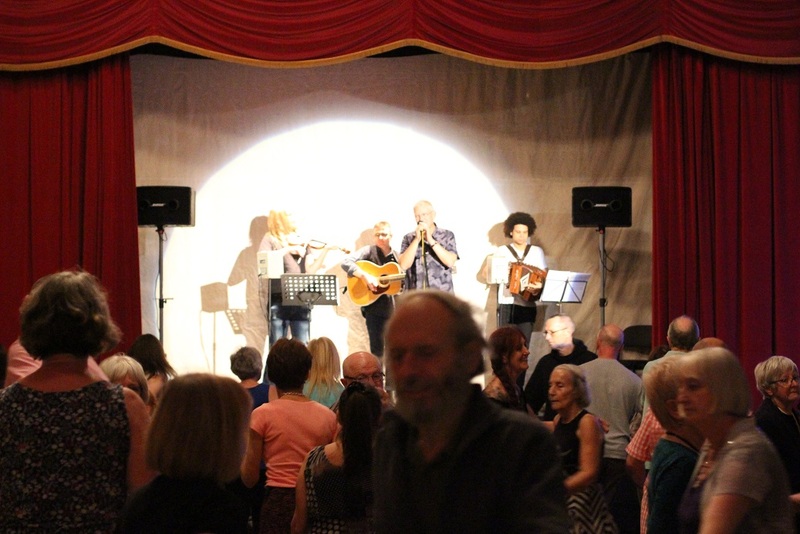 All in all, the evening was a terrific start to the new season of Ryburn 3 Step Barn Dances which continues on Saturday November 19th with music from local band Tenterhooks and caller from the other side of the hill, Sid Calderbank. Jemma Gurney – Whistles and Soprano Saxophone. 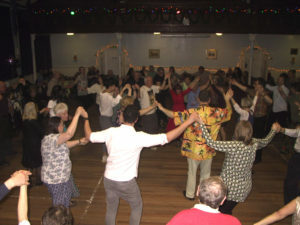 Northumbrian music ruled OK at the R3S dance at Waring Green Community Centre on 26 March! The 5 – piece band from the heart of Northumberland delighted us with sequences of the most exciting tunes from the tradition while Pete and Sue called a range of Northern English dances including a Northumbrian version of the ‘Flowers of Edinburgh’ to the great enjoyment of the dancers. During a well-earned break from the dancing, we were treated to an exceptional display of Northumbrian piping in a duet from Paul Knox and Alice Burn and then an unbelievably precise (and fast) solo set with variations from Alice. A fabulous evening!